I do like a bold red ink, and lately I have been exploring the exciting world of orange! No longer available, it was one of the limited edition inks that was produced in conjunction with the writer series fountain pens. But, it is an example of a true, rich, bold red. Pelikan came out with a great concept. Introduce an Ink of the Year each year and produce it for that year. For 2019 the colour is Star Ruby. 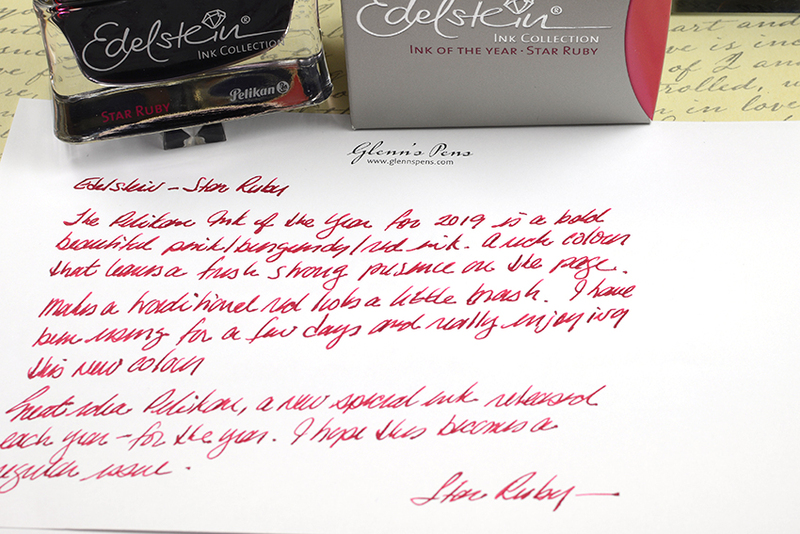 Although there is a Ruby (red) ink in the Edelstein line, Star Ruby has an interesting pink/burgundy tone of red. I find the ink to be a rich colour that I have really enjoyed writing with. The colour is fresh but has enough colour substance that makes a statement. Like the Edelstein line, the writing characteristics of the ink is very good. A plus, the ink comes in a beautiful crystal glass bottle that holds 50 ml of ink. This is the new line of inks and colours that Caron d'Ache released in 2014. I came across them when in Paris. Immediately grabbed some of the stunning bottles, and started to enjoy the new inks. The Electric Orange is just that, electric! It is a bold orange. This is the orange in the iroshizuku line of inks. Like the other colours, the performance is good. Seems to work well in a variety of pens I have loaded with the ink. It is a lighter orange, and depending on the size of the nib, a red tone can appear in the shadows. With Stub nibs the colours comes out with more punch. 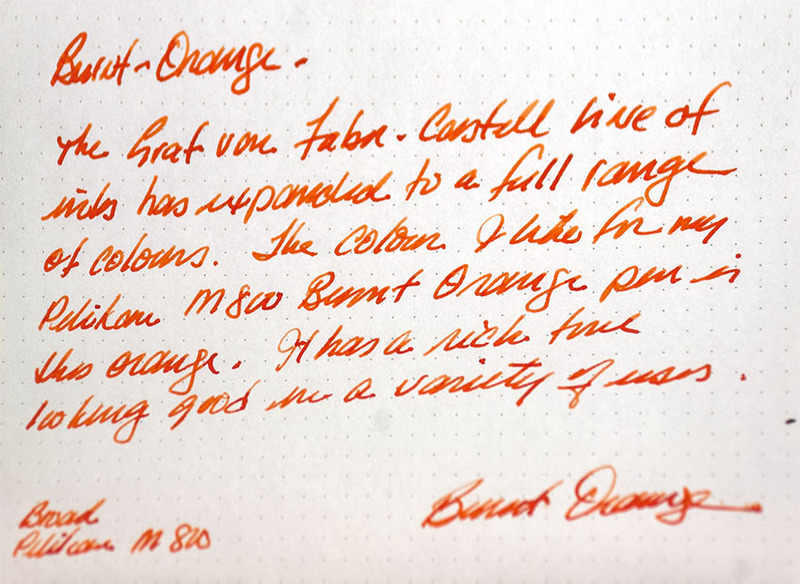 The Faber-Castel Burnt Orange has a good tone, it dries darker than it first appears on the page. I did find the ink colour changes with nibs and paper. 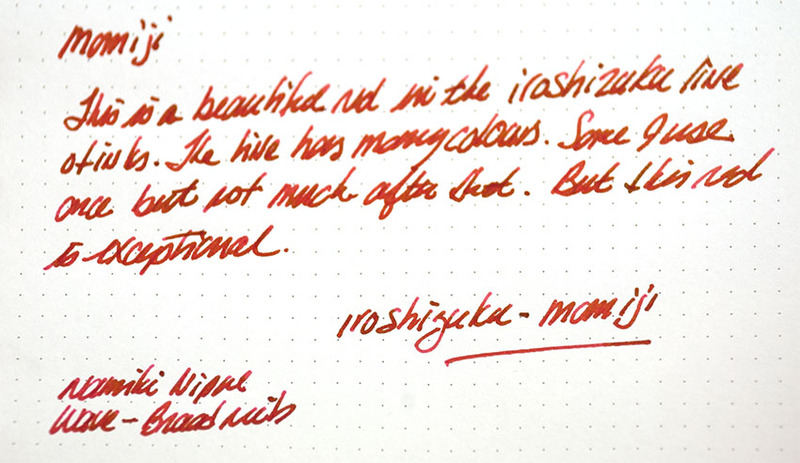 The iroshizuku line has a couple of oranges, and this is one of the ones that I use the most because it has a bold rich colour, a ink with enough substance that it even lays a good solid line of ink using a Waterman Stub nib.